Here is my strategy. After finding something that I really want more than anything else, I ignore it, I turn my back and walk away, I put on my best poker face. Oh come on, you know me better than that. I proceed to tell everyone how much I want it. How wonderful it is...... I definitely need a better strategy. However, in this case it worked. I think everyone was cutting me some slack because of my surgery, so no one bid against me. Bottom line, I walked away with two of these fabulous lamps. They had been sitting in someone's living room for 60 years and are in amazing condition. The lampshades are drip wax. I have never seen anything like them. I am not even going to tell you what I paid for them, because I would hate to go to jail for theft. SIGH!!!! Some things in life are just too good to be imagined. They will be going into ImSoVintage this weekend. I am so glad you're doing well and glad for you! I have my parent's lamps - they mean so much to me - you've got a treasure! I wonder, too, drip wax. If the light bulb gets too warm do they start dripping again??? or if you leave the sunlight coming in directly. Hahaha. Congrats on a great find. 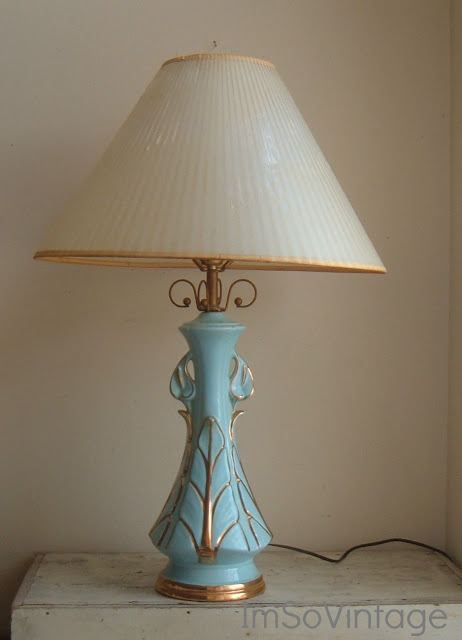 Beautiful lamps! Everything always comes around too...look at the color! Perfect! I'm very intrigued by the dripped wax lamp shades. Incredible lamps!!! Wishing you a restful weekend and a full recovery. This lamp has it all. Great condition, perfect color and a very neat shade. Did I read correctly you have two? How lucky. I have never heard of these before! Do they filter the light a different way? Obviously someone didn't appreciate them like you do..so now they have new home, and they are loved. You go girl! LOVE these lamps! What a find! Those lamps are gorgeous! Love that color! Cool lamp. I can just see the pair of these in a hipster apartment! If we guess the right price will you just shake your head yes or no...up or down as a hint? heehee! They really are fabulous! I've never seen a shade like that...how fascinating!